"Time Rate Control and Related Technologies"
According to Prof. N.A.Kozyrev's theory of active properties of time and by Academician Albert Veinik's chronal theory there is real technological possibility for local changes of time rate. It is not related with relativistic velocities but it is quite engineerable technical projects. Energy of system in general can be presented as sum of electromagnetic energy and gravitational energy. In other words, gravitation as property of space can be described as time flow energy, by Prof. N.Kozyrev. This kind of energy depend of changes of entropy, energy density, motion, rotation, frequency of oscillations, temperature, electric and magnetic potential of the system, that was experimentally proved by Prof. N.Kozyrev. To make the generator to produce effect for a long time it is necessary to repeat the changes. According to TRC theory, the changes should be asymmetrical to create unidirectional chronal effect. Sinusoidal changes normally used in any equipment are symmetrical processes to produce similar alternate oscillations of time rate and by this reason there are no permanent chronal force in one direction. Practical applications for the technology are aerospace industry, energetics and medicine. This topic is known as warp drive, please, look Dr. Puthoff's comments on it. Engineering part of this project can be solved by any electrotechnical laboratory to produce different kind of photons. The rate of time as velocity of transformation from cause in effect, by N.Kozyrev and L.S.Shikhobalov is defined by formula F.1 u=c/137 F.1 where 1/137 is fine structure constant, and c is know velocity of light. By S.M.Poliakov similar formula describe inner structure of energy for any photon that consist of 137 discrete parts. Understanding of the photon structure let us the way for time structure description and time control. By TRC there are ways to control velocity of photon up to zero velocity photon (ZVP) state. 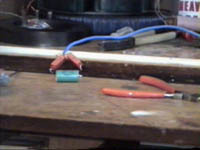 On Fig.2 the same idea but with diodes by Avramenko. Resonance state of 1/4 wave length is original author's proposal. It is known from wireless equipment technologies. 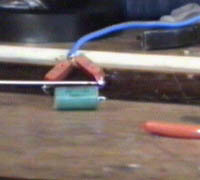 On photos here you can see arc between capacitor legs and this capacitor is charging from one point of wire where the potential is changing in time. Also there are known Tesla's methods to take power from single-wire line in resonance state. So, we can take power from chronal gradient to move the system in time dimension. It is small power but it is working technology already. In opposite version the power is not generated from the point of space but it is "pumped" into the point of space. Technically it can be made as pulsed magnetic field incoming into center of the system. Similar experimental work was made in 1990th by Dr. Vadim Chernobrov, Moscow. There is possibility to use "moving into the point" wave in gas plasma or magnetostriction and electrostriction effects to compress the Ether in flat system, Fig.3 or in volumetrical system Fig.4. Fig.3 Fig.4 The tetrahedronal system of co-ordinates was proposed by Josef Hasslberger, Italy . It should be accepted as a basic description of the structure of space, since four axes are a necessary minimum for any volumetrical system. Also his work allow us to understand physical sense of centripetal motion as syntropy process that is part of thermodynamical cycle. Central point of the system Fig.4 can be "pumped" by waves of the Ether density produced by any known method. Most powerful way is plasma longitudinal waves. Technically the design can be made of four vacuum tubes in tetrahedronal superposition. Chronal potential of this point will be changed and it can be considered as some chronal charge Qch. By means of linear or orbital motion of this chronal charge Qch the chronal field should be generated, and the direction of the field should be determined by direction of rotation and the sign of the chronal charge, Fig.5. Fig.5 System of power generation by 1.1. should produce negative chronal charge that in sum with global time rate should demonstrate itself as decelerated local time. System of energy pumping by 1.2. should produce positive chronal charge that should demonstrate itself as accelerated local time. It is assumed to find antigravitation propulsion effects also. One more way for local space-time engineering can be proposed. According to Dr. Nassikas's theory the time direction and electrical charge are correlated notions. Positive electricity in Nature is the proton and natural negative electricity is the electron. By this way, I assume some antigravitation effects for proton current case since it should be connected not only with some magnetic field but with other sign of time axis also. Technical way for this proton current was proposed in 1994 but nobody was interested. Shortly, it is possible to rotate metal cathode of simple electrolytic cell that is saturated by protons. In this case so called "gravimagnetic field" can be detected, I suppose. Known Podkletnov's gravity screening effect in this conception is particular case for proton current since in superconductivity state the proton currents are possible. But I think you are agree, the saturated cathode is more easy way. If the tests will confirm it is the working conception, there is the way for antigravitation space drive and for local controlled time rate changes. It was proposed by N.A.Kozyrev to consider any star as special machine that transform input energy of "time flow" in heat energy. In my paper it is described the way for reversed process and the field can be concentrated by the same way as magnetic field of electric current can be concentrated in coil of wire. Prof. N.A.Kozyrev investigated some processes to change the "density of the time flow" by his theory: the dissipation, the crystallization, the evaporation and the deformation. By TRC theory, any kind of non reversible changes of energy volumetrical density is the reason for the effect. According to Academician Albert I. Veinik, polyethylene can be used as chronal screen but its screening properties are decreasing and after some period of operation it is necessary to change the screen. By this experimental data it was made the conclusion about possibility of such sort interaction between matter and chronal field when the matter structure is changing. Understanding of the difference between initial state of the polyethylene molecular structure and its final state after long time operation as chronal screen, let us the technology for chronal screening. It is proposed to test the effect of local time rate changes if the process is the changes of some matter density, for example, gaseous body. Also the plasma density changes can be used. Two opposite direction of changes in the time rate can be created: for dissipation it is entropy direction and for crystallization it is the syntropy direction. Different types of detectors should be investigated: clocks, quartz oscillators, electromagnetic wave source (radio transmitter), laser beam of known wave-length, stable biological processes. It is planned to investigate the possibility to reduce the radioactivity of tested materials in local space-time. It is planned to investigate influence of chronal insulation onto viruses activity, radioactivity and onto vital processes of biological systems. It is predicted to detect weight changes also. Copyright Alexander V. Frolov, 1999. All rights reserved.